Hull designs: Hard chine "V" section, load carrying hulls with flared bows to limit spray. They rely solely on lateral resistance to prevent leeway. The design was coupled with moderate sail area provide a safe and stable sailing platform. that reward. The reason the boats are so stable is that the relatively short rig combined with the Hard chine hull design allow the boat to unload the sail area by slipping the boat sideways in a sudden gust. It's very hard to turn turtle with this design and this along with the high build quality, is the reason most of these boats are still sailing today. 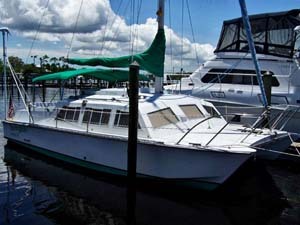 In addition, it should be noted that these boats have solid Fiberglass hulls which will carry heavy loads far better than many others due to a wider hull-beam ratio, deep rocker design, extreme dead rise hulls with hard chines, and big, powerboat- like transoms (this was written by the noted multihull author, Charles Kanter). They also handle extremely well. Unlike others of that generation, they tack securely without backwinding the jib and handle smartly around docks, easily turning in their own length. Design Features: Their shallow draft and opening cabin windows all with removable screens make these boats perfect tropical cruisers. Construction: Solid fiberglass Hulls and cored fiberglass bridge deck are one piece moldings bolted together. 3/4" Plywood wood bulkheads are bonded to the hulls. Which Cruising Cats Hold Their Value? Catalac, Cherokee, Iroquois, and Prout are cruising catamaran names that live through the decades. Bill Ware of 2Hulls brokerage in Fort Lauderdale, Florida, says, "Generally speaking, the English cats have the best resale value. They built the most enduring catamarans in the world." Depending on condition, they can fetch higher prices now than they did when they were new, even adjusted for inflation. The Iroquois, designed by legendary Rod MacAlpine-Downey, is a high-quality, fast-sailing, Weatherly vessel with pivoting centerboards and kick-up rudders. Catalacs, an 8 meter (27-foot), 9 meter (30-foot), 10 meter (34-foot) and 12 meter (41-foot), each rugged and with great carrying capacity, exceptional layout and good handling, sail the other end of the performance spectrum, but many have crossed the Atlantic. Catalac catamarans, with over 600 units built and sailing, have probably brought as many hours of happy, comfortable and safe boating to more people than any other vessel. It is hard to find any comparable production vessel that has so well achieved its design objectives. One that comes close is the monohull, Morgan Out Island series, the most popular cruising boat ever.